I have been getting more and more into domestic ducks and have been selling a few ducklings and an increasing number of duck eggs at the gate, but since starting the poultrykeeper website with a couple of others, I decided to expand my knowledge and I’m so pleased I uncovered this gem of a book from the Ashtons. The Ashtons of course are by no means new to publishing books about ducks (and geese) and you will find they have a number of titles to their names. They write regular articles for a string of magazines, including smallholder, and in fact as far as ducks go, I think they must be one of the leading authorities in the UK with 28 years of duck breeding experience. The chapters of the book are grouped into three parts. Part one covers the history and characteristics of the old established breeds, (like the Aylesbury and Indian Runner) and the ‘designer ducks’ (like the Khaki Campbell and the Silver Appleyard) that were created from them once they arrived in Europe. Part 2 covers behaviour but also there are 2 chapters on purchasing and managing adult stock that I found very educational, covering just about everything you’ll ever need to know to keep ducks – from the most basic advice on feeding to the more difficult to find information like egg laying capabilities of breeds, age and declining egg production, as well as ideas for fencing, pests and predators (including the less obvious Mink, Marten and Polecat). There are photos and illustrations throughout. Part 3 filled many gaps in my knowledge. The whole breeding process is covered from selecting the most suitable stock, incubating eggs (something I’m still trying to perfect) to rearing the ducklings you hatch. 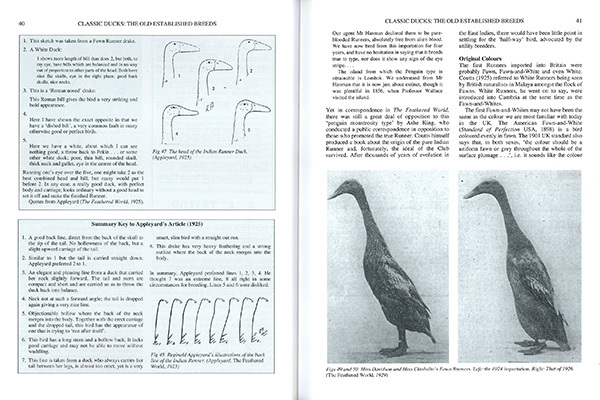 To finish off, there is a useful appendix for reference which covers many of the common health problems you may encounter with your ducks. There are black and white photos and illustrations throughout and 8 pages of colour photographs in the centre of the book. The information contained in this book is worth far more than the cover price. A definite MUST HAVE for the book shelf and I’m pleased to say, now my number 1 book to recommend to both the novice or the more experienced. Don’t go without this book!